Addressing the General Assembly this morning El Salvador’s President, Salvador Sánchez Cerén called on the international community to support Central American countries to overcome the crisis generated by the increased flow of unaccompanied migrant children travelling to the United States. 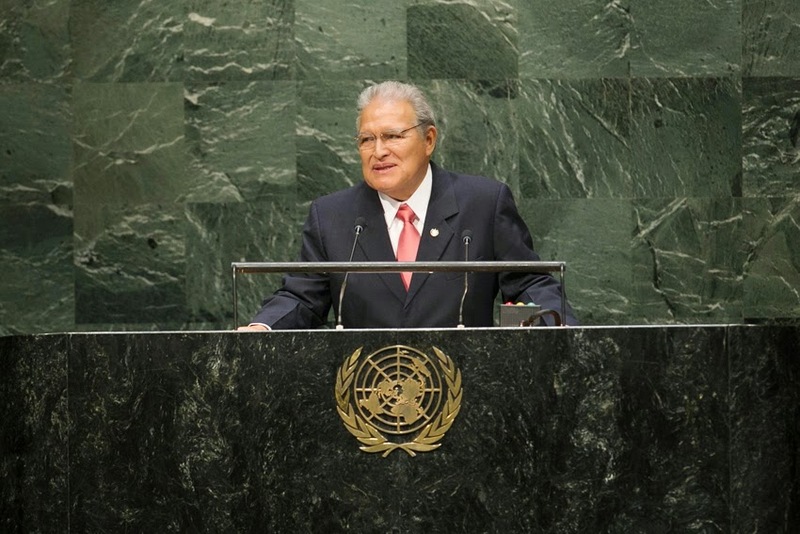 “El Salvador makes every effort to improve the quality of life of the population and to build the conditions that allows us to strengthen values, family unity, create opportunities for new generations, and raise awareness about the risks of irregular migration,” said President Sánchez Cerén. It is important to work with communities of origin of migrant population, to generate better conditions, increase the investment in education, health, safety, and jobs. All this must be done with a perspective of a joint responsibility between countries of origin, transit, and destination. “It is necessary the UN system, especially the General Assembly, assume an increasing role on the migration issue and recognize human mobility as a relevant factor in the work of the organization,” he said. On a national level, El Salvador had reduced extreme poverty to 13.6 percent; allocated 14.8 percent of our GDP to social spending; and raised primary education coverage to 93.7 percent while reducing illiteracy by more than five percent. Mr. Sánchez Cerén said that any future development agenda must include issues like migration, climate change, food security, education, and health. Since Wednesday, speakers have taken to the podium in the UN’s renovated General Assembly Hall to address the 193 Member State on the theme of “Delivering on and Implementing a Transformative Post-2015 Development Agenda” as well as urgent crises ranging from the ongoing conflicts in Syria, Iraq, Ukraine and South Sudan. Taking to the podium this evening, the Minister of Foreign Affairs for Guatemala, Carlos Raul Morales, said migrant crisis in his region requires a strategic response “that attacks the structural roots” of this phenomenon and offers sustained actions. “This implies working together to promote greater prosperity in Honduras, El Salvador and Guatemala, and a lucid management of temporal work for migrants that satisfied the demands of the labour market in the United States and the supply of workers in Central America,” he said. On a national level, Guatemala was “slowly winning its battle against crime and impunity” vis-à-vis mechanisms such as the International Commission against Impunity in Guatemala (CICIG), which has strengthened criminal prosecution against mafia networks. He welcomed regional partnerships, for example with Mexico on the reconstruction of border crossings and the signing of a historic agreement for a project which would transport gas from the Gulf of Mexico to Guatemala and the rest of Central America. On climate change, he said, his country was in the middle of a bad drought which led to the loss of crops of basic foods for hundreds of thousands of families.